This entry was posted in Accounts of violence and tagged Occupy Taksim, Police brutality on 2 June 2013 . 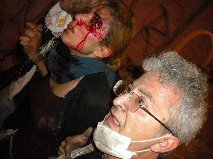 This entry was posted in News and tagged #direngeziparkı, Istanbul Chamber of Medicine, journalist, Occupy Taksim, peaceful protests, police attacked, Resist Gezi Park, Sırrı Süreyya Önder, Taksim Gezi Park protesters, tear gas on 31 May 2013 . This entry was posted in News and tagged demonstration, demonstrators, environment, Gezi Park, Occupy Taksim, onslaught, police attack, protesters, Tayyip Erdoğan, TOMA, trees on 30 May 2013 .